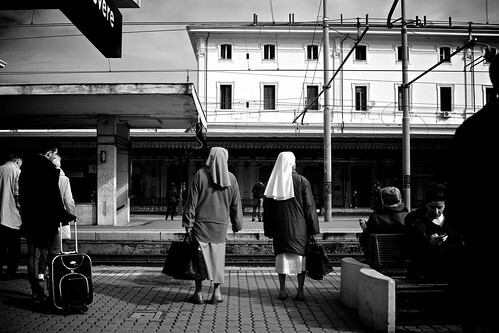 58/365 – “Habemus Papam” nr.30, a photo by Luca Rossini on Flickr. Time to leave? It almost is, for me, time to leave the “Habemus Papam” theme and, with it, the sacred-side of Rome. These nuns aren’t probably leaving either Rome or the Pope, since on this track passes the train directed to Saint Peter’s basilica, but to me this view already feels like a farewell. I’m not going to take this train, today, and I’m not going to take it for a while, I guess. My next train goes somewhere completely different. You’ll see it in a couple of days. It’s too early for the closing comments, I still have one day and one photo before closing the second monthly theme of the 365 Days of RX1: one camera, one lens, 12 projects. And it’s way too early to unveil the next monthly theme. So I guess this is one of those days in which I let the photo do the talking too. You should just know this: it is a farewell shot for what has turned out to be a very important subject to me.